ROLLING THUNDER (1977): Taxi Driver’s Drive-In Shadow Twin – Schlockmania! The second half of the 1970’s saw Paul Schrader become one of the rising screenwriters in Hollywood. Taxi Driver is the one that people remember best but there was a flurry of Schrader-penned scripts that were produced around that time, including The Yakuza and Obsession. 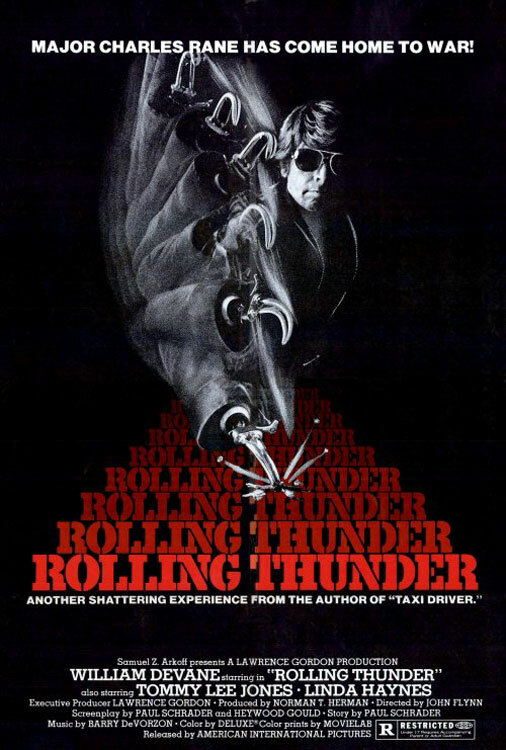 The one that cult movie fans remember is the one released by American International Pictures: Rolling Thunder. It was marketed as a straightforward revenge picture but, as is often the case with Schrader’s work from this era, it’s much darker and more complex than that description suggests. In fact, you could call it the drive-in’s shadow twin to Taxi Driver. 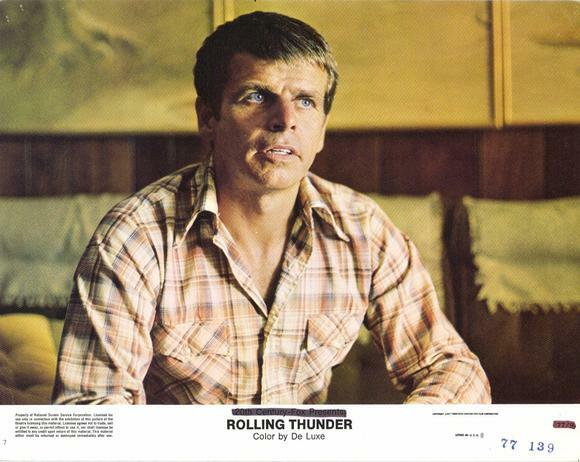 The main character in Rolling Thunder is Charles Rane (William Devane), an Air Force man who returns home in 1973 after spending eight years as a P.O.W. in the Vietnam War. He is given a hero’s welcome by his home of San Antonio but it’s a hollow gesture: his wife has fallen in love with another man, his son doesn’t remember him and people relate to him as a symbol instead of a human being. His struggle to fit into civilian life gets derailed completely when a band of thugs murder his wife and child and cripple one of his hands while robbing him of an award he was given. Once Rane recovers, he begins quietly and methodically plotting his revenge with the help of sympathetic barmaid Linda (Linda Haynes) and fellow ex-P.O.W. Johnny Vohden (Tommy Lee Jones). As is often the case in a Schrader script from this era, the third act hurtles towards an ending where the only thing guaranteed is a shocking outburst of violence. The end result is so memorable that Quentin Tarantino named a film distribution company after it. Though Heywood Gould was brought in to do some rewrites, it retains that combination of grim, old Hollywood machismo and European cinema-influenced cerebral coolness that is unique to Schrader’s work. The story never gives in to easy emotional manipulation nor does it try to glorify its obsessed, quietly angry protagonist, who comes off like a more righteous but no less scary mirror image of Travis Bickle. It also a streak of dark, almost nihilistic humor that comes out with repeat viewings. Most interestingly, it tackles the subject of war vet alienation in a way that Hollywood movies wouldn’t do for another decade or so. 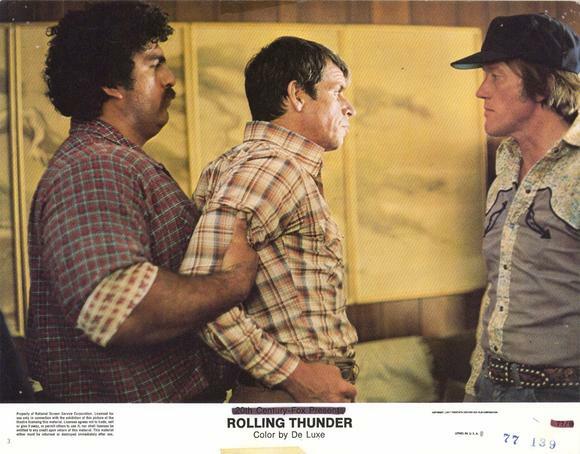 Better yet, Rolling Thunder benefits from strong direction by a filmmaker gutsy enough to roll with the storyline’s punches. John Flynn was a specialist in hard-boiled crime stories – his adaptation of The Outfit is one of the best crime movies of the 1970’s – and he taps right into the grizzled nuances of this script. He gives the film a noirish mood via cinematography full of shadowy interiors and gets his actors to downplay in a naturalistic way. When the time comes for violence, he handles it in a realistic, hard-hitting way that plays for keeps: the scene where Rane and his family are attacked is haunting stuff and the finale makes Rane’s revenge look as terrifying as it is suspenseful. 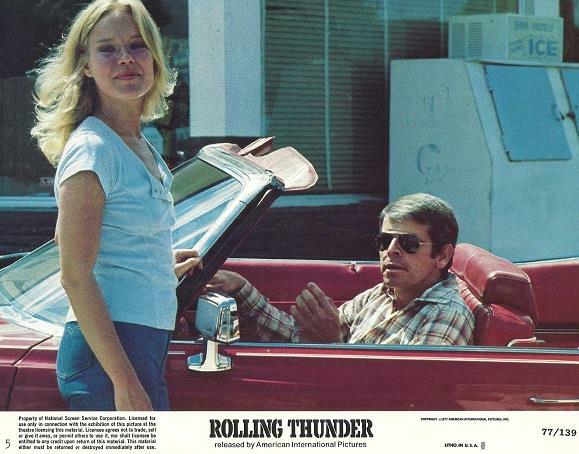 Finally, Rolling Thunder has a fantastic cast that anchors the film’s cool, no-nonsense tone. Devane wisely underplays the role, giving the audience a sense of the character’s emotional shift through subtle mannerisms (note how he reflexively dons his shades when he feels challenged by Linda) so when his rage erupts it really grabs the viewer’s attention. Jones also does impressive work as another man who has trouble adjusting to civilian life, showing numbness in domestic settings but coming alive with childlike glee in dangerous situations. Haynes lends a welcome note of humanity as the hard-luck party girl who falls for Rane while James Best and Luke Askew offer memorably reptilian turns as the crooks that Rane tangles with. 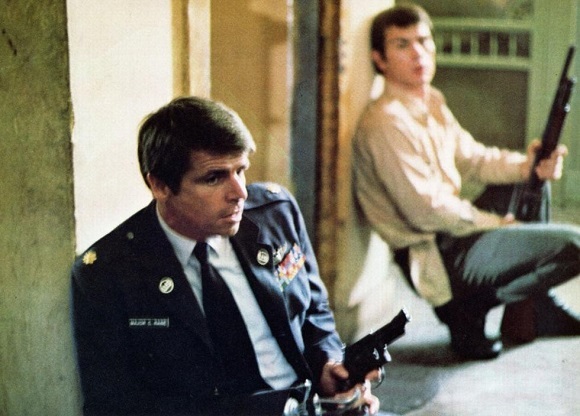 In short, Rolling Thunder lives up to its reputation as one of the toughest, meanest revenge movies – and the smart script and artful direction give it a style and a fierce intelligence that help it stand apart from the pack. Whether you’re a Schrader scholar or someone who just enjoys a good revenge story, Rolling Thunder is a must-see.